The Embassy Suites by Hilton Akron Canton Airport, operated by Commonwealth Hotel Collection, will install the FlyteBoard hotel information display by Flyte Systems. 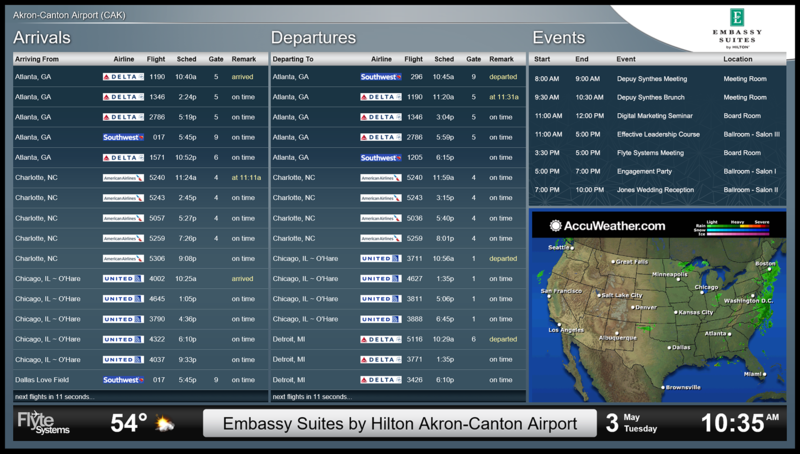 The FlyteBoard digital display will show arrivals and departures for Akron-Canton Airport, property events and Doppler Radar Weather for guest travel convenience. Flyte Systems is the leading provider of cost effective airport travel and flexible digital signage property information. The company delivers displays and digital signage content for hotels, corporate training centers, convention centers and related businesses. “We opened our Embassy Suites in February this year and it is already a favorite of people coming to Akron for business, sporting events, reunions, weddings and other activities. Our FlyteBoard hotel information display will provide guests with airline schedules and gate information for nearby Akron-Canton Airport and be an attractive reader board for property events. We offer a personalized guest experience and FlyteBoard is part of that,” said Julie Karam, Director of Sales and Marketing for the Embassy Suites by Hilton Akron Canton Airport. Featured in Hotel Online and Hotel News Resource.